Welcome to the Blogger Christmas Series. 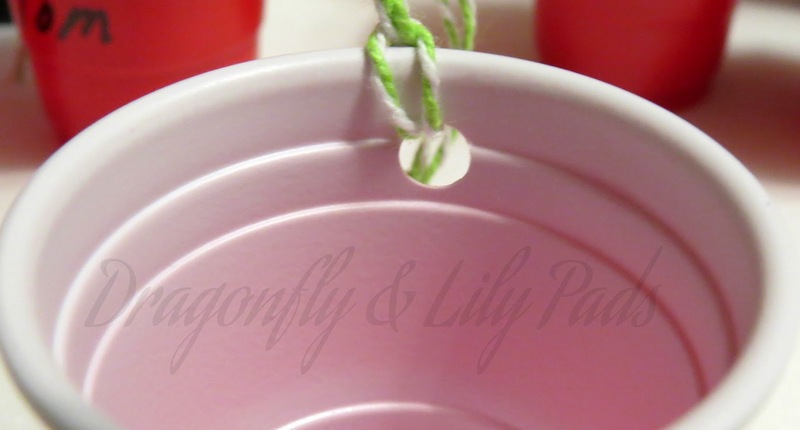 I am sharing directions on how to make Red Solo Cups ornaments. A group of Blogger friends decided to make this day even better by coming together, and sharing our posts with each others readers. I know as you read through the series, you will be as impressed as I am with these amazing talented individuals. My guess is your hands will be tired from creating your Christmas Magic at home, or at least from pinning on Pinterest for the future. Now I know you all have the song going through your head and by now you are at, "Lets have a Party" When we have a family party this is what our counter tops and tables look like. Do you have the same situation at your house? This Party was the day after Thanksgiving at my sisters house. We celebrated five birthdays. Normally I would not use shot glasses for kids but, in this instance they look like mini cups that we use every party for our family. You will see during this post I have a large family. Each year Prince Charming and I buy Christmas presents for our nieces and nephews. When the kids were younger we could afford to buy them a gift but now with just under 30 gifts we have become creative. I made Monograms Gifts for all of them last year. This year we are giving them some cash but it must be done in a personal way. That is how I came up with this +Solo Cup ornament idea. Each cup will carry a bit of cash inside for the person named on the cup. 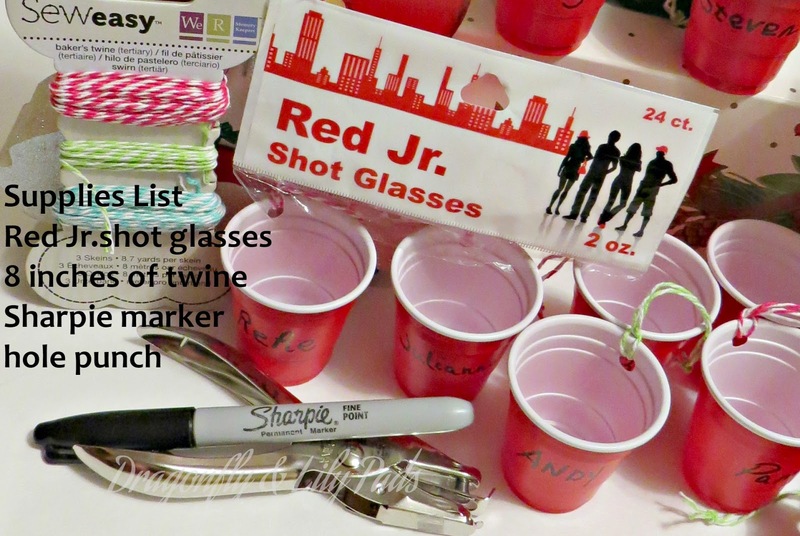 I purchased my shot glasses at a pharmacy but, they now sell them at the +Dollar Store Crafts. The remaining items I had in my stash at home. Luckily I found them all with out going on a two hour hunt in my craft room. During a Chat with my sister and my mom I punched holes in the cups with a regular paper whole punch. You can see that I chose a spot near the rim. 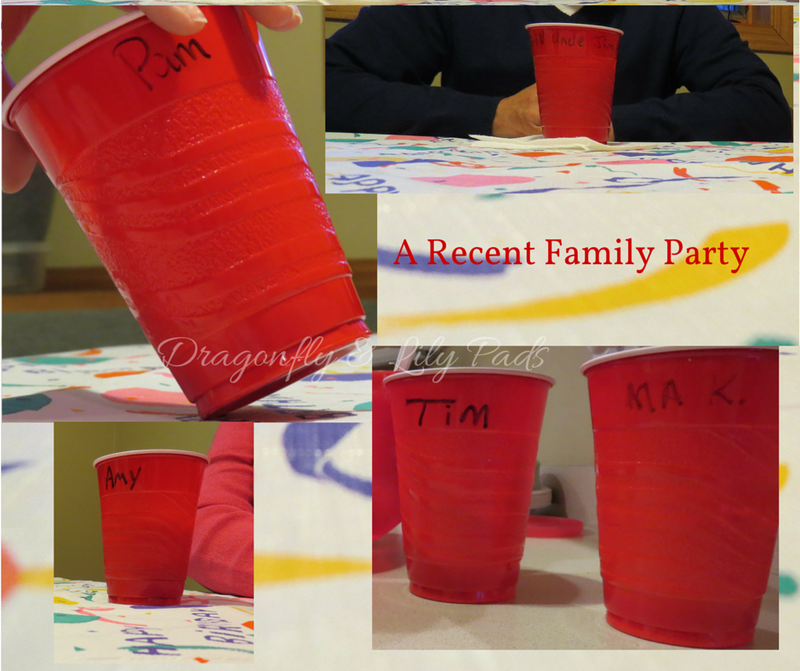 Next keeping with tradition I wrote the names on the cups with the fine +Sharpie black marker. Then I cut 8" of decorative twine tied a knot in the top and looped it through the hole I made earlier. My last duty is to fill them all with their Christmas Cash so they can save up to buy an item they would like. Follow my me on Instagram in the next few weeks to see a few on my trees. Now join me in Welcoming the next group of Bloggers and get ready to be blown away by the amount of talent they possess. Introducing the Blogger Christmas Series! Thank you the cost is so afordable the kids can get more cash too. These are so cute Karen! I'll bet the kids would love it! How cute! Believe it or not my husband was a Solo cup for Halloween (we use them a lot, too!) I'm sure the kids will appreciate the money and the thoughtful way you've presented it. I am glad you like the ornaments. Thank you I am excited for the kids to see them. I am sure they will like the cash too. Your husband must of been the hit of the hit of the party. That is a great Halloween costume. Thank you for taking the time to share your thoughts. It means the world to me. Thank you for your sweet comment. Your encouragement means the world to me. This is a great idea and so easy to do thank you for sharing. I've never seen red shot glasses like this and I'll be on the lookout for some. 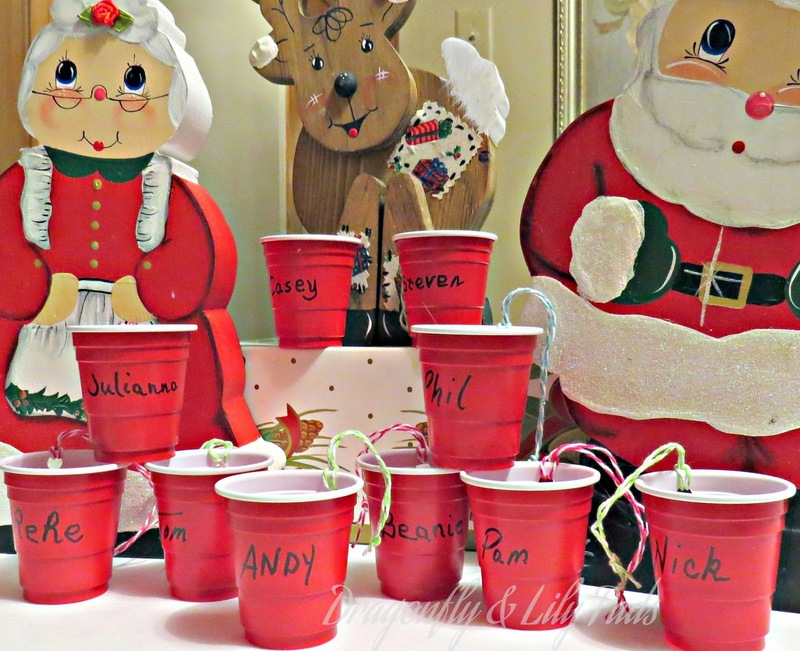 I am so glad you liked the Red Solos Cups. I purchased them at a local grocery/drug store. Since I bpught them I saw them advertiised at Dollar Tree. Thank you for visiting and leaving a lovely comment. Your note encourages me so much. What a cute idea! Thanks for sharing at our Dollar Christmas party. Thank you for hosting The Dollar Tree Christmas Party. You and Shannon are the Hostesses with the Most! Cute idea for money gifts, now...thanks for sticking that song in my head for the night.